Our Mission is to provide a venue to bring together and Honor all US Military Veterans each year on or near Veterans Day. 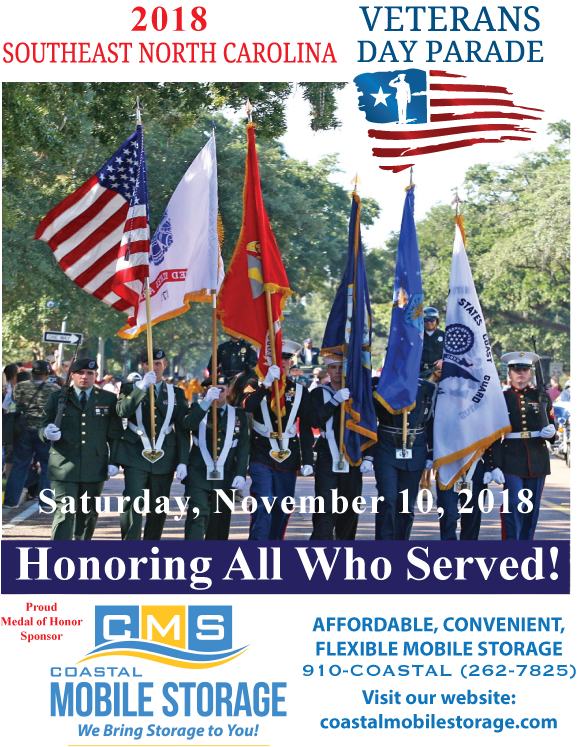 We are having the second annual Veterans Day Parade to be held in Downtown Wilmington, North Carolina on November 10, 2018 at 11:00 am in conjunction with the New Hanover Veterans Council. We are inviting everyone from South East North Carolina and beyond. The idea for this parade was conceived by Marc Biddison, a Vietnam veteran. After our troops returned home they were shunned and not welcomed. The theme is “Honoring All Who Served”. It is time that all veterans from all branches of the U.S. Armed Forces are Honored for their service . He has formed a committee made up of a group of friends both veterans and those who just want to help out to organize this event. We want all Veterans to participate and as a Special Honor, we are making our Grand Marshal of the parade this year a Purple Heart recipient. There will be no charge for any Military Personnel or Groups, First Responders, School & Military Bands to participate in our parade. This parade is to to Honor All Who Served! View our 2018 Flyer here.